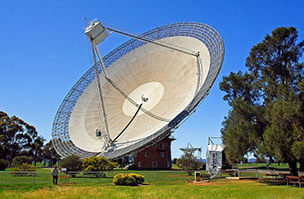 CSIRO Parkes Radio Telescope - Better known as 'The Dish' Open all year round, a must see when you're in Parkes. 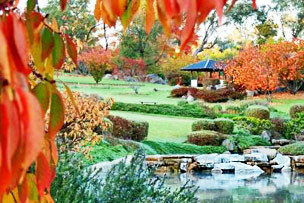 Located 20 kilometres north of Parkes off the Newell Highway. The star attraction in the movie 'The Dish'. Opening times8:30am to 4:15pm Daily 8:30am to 4:30pm; Christmas school holidays 8:30am to 5pm daily. 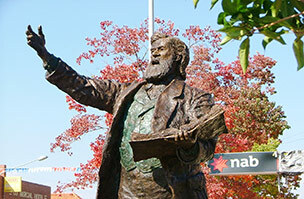 Henry Parkes Centre - Parkes Visitor Information Centre is located up the northern end of town. 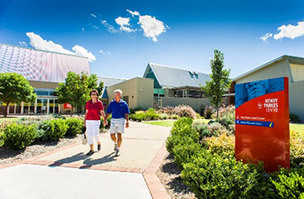 The Centre houses the King's Castle Elvis Exhibit, the Parkes Motor Museum (featuring Elvis' Cadillac) and the Parkes Local History Museumand Pioneer Park Antique Machinery Museum. The King's Castle Elvis Exhibit is a unique collection of original Elvis memorabilia owned by Greg Page. The exhibition displays genuine Elvis artefacts which were owned by Elvis or directly connected to his life and are on display in this magnificent exhibition telling the story of the on (and off) stage life of one of the world's greatest entertainers. The Henry Parkes Museum and Antique Machinery Exhibit depict early life in Parkes through objects, photos and historical information. The Society holds the Annual Tractor Start-up Day in March/April each year. Public Holidays: 10am - 4pm. 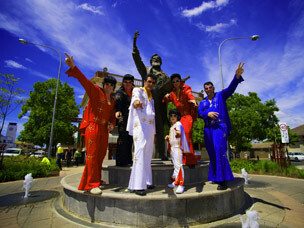 Parkes Elvis Festival - Every year on the 2nd weekend in January. Parkes is definitely the place you can see the king. It is a five day Festival Program the town comes alive. 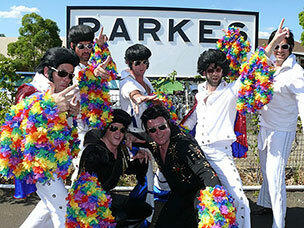 Come from Sydney on the Country link Elvis Express on the Thursday or the Rex Airlines Priscilla Plane. The motel has Karaoke on the Thursday night, and two course dinner and show on the Friday night with Elias Jahmour and Carmine Cimilio. On the Saturday we have Carmine and a special guest with a two course dinner and show. If our motel is at 100% occupancy we can assist in arranging accommodation in Orange (75mins away) at our sister Motel the http://ambassador-orange.com.au, we would then love to have you come over to Parkes for our dinner and shows in the evening. Please discuss this with us. Modern Mining Trail - is a self-drive tourism experience that takes visitors on a journey to see the world class gold and copper mines. 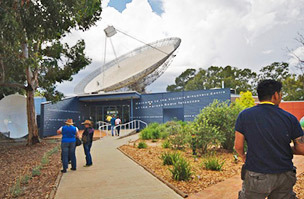 The Modern Mining Trail features six mines as the signature attractions: Northparkes Mine (Parkes) and the Peak Hill Open Cut Experience (Peak Hill), Newcrest Mining's Cadia Valley Operations (Orange), Barrick Cowal Gold Mine (West Wyalong), Great Cobar Mine and Peak Gold Mines (Cobar). Map can be obtained from the motel or the visitor centre. 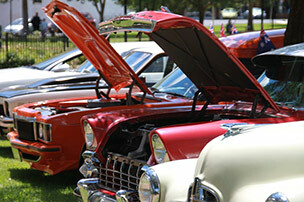 Parkes Country Music Spectacular - is held annually on the October Long Weekend. Artists and groups entertain for night time concerts. Two day talent quest with awards night held on the Sunday night. Enjoy family functions, buskers, poets and street concerts. A great weekend for all. Annual Antique Motorcycle Rally - The Parkes Antique Motor Club hold an annual motorcycle rally for veteran, vintage and classic motorcycles built before 1964 during the October long weekend. 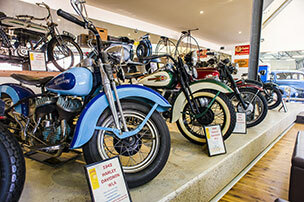 Running for its 37th time in 2013, this Rally for Heritage Motorcycles is one of the longest continually running in Australia. The flat country roads and low traffic volumes make it particularly attractive to veteran (pre 1964) and vintage (1919-1931) machines. 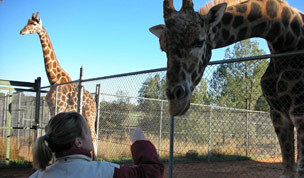 Western Plains Zoo - See all the animals without fences. 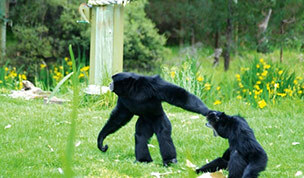 This fabulous zoo is just 75mins away from Parkes and is something you shouldn't miss when you visit the Central West. Take your bikes if you can. 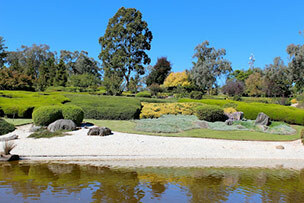 Japanese Gardens in Cowra - Situated on the site of the infamous Cowra Prison Camp these gardens are spectacular and symbolize the bond that now exists between the Japanese and Australian peoples. 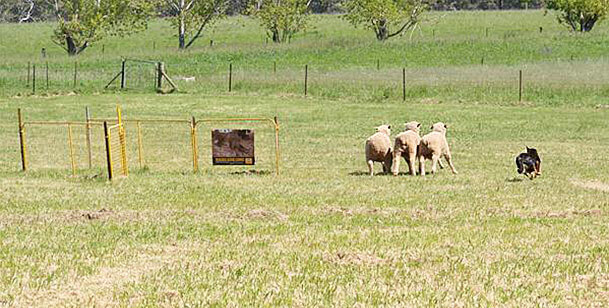 Orange Field Days - Generally considered to be the most important Field Days in Australia in October. In nearby Orange – 60 mins drive. 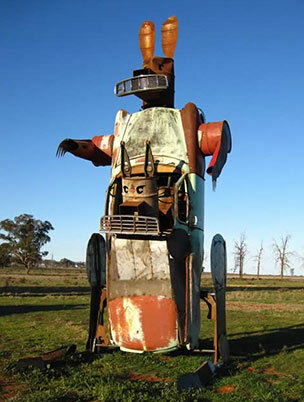 Utes in the Paddock Burrawang West Station about 50mins from Parkes on the road to Condobolin, you will find 15 utes all dress up in a farmer’s field, a nice drive and very peaceful and piece of art!